NAV1GATE: Connect today. Excel tomorrow. Welcome to UNCG! This is the beginning of an incredible new experience that will transform so much about your life, and we are thrilled to begin this journey with you. It is time, from day one, to get off to a strong start. That’s why we created a unique experience for you: NAV1GATE. NAV1GATE is for incoming freshmen and transfer students. This day, your first day at the G is designed to help you get to know the people, ideas, and opportunities that await during your time here at UNC Greensboro. It is a day set aside entirely for you – our newest Spartans — to be inspired while also getting serious about the path ahead. You will hear from our chancellor, Franklin D. Gilliam Jr. You will connect with faculty, staff, and student leaders who will show you the resources and support systems available to help you excel in your first year. You’ll participate in some Spartan traditions that mark the beginning of your college career. And while the day is designed to get you ready for the academic experience ahead, you’ll also have some fun with your new friends, and our welcoming faculty and staff. Your future is unlimited when you know how to navigate your journey. NAV1GATE 2019 information coming soon. The Rawk: Brought to UNCG’s campus by Alpha Phi Omega in 1973, this quarry rock serves as a campus message board. It is located near the dining hall and Clock Tower. There is an unwritten rule that a message must remain on the rock for at least twenty-four hours before it can be painted over. Apples for Minerva: Minerva, who is associated with wisdom, has been a symbol for UNCG since its earliest days. The statue of Minerva located near Elliott University Center was commissioned in 2003 by the Class of 1953. For some students leaving a coin, a note or an apple may bring them good luck. The tradition of leaving offerings for Minerva goes back to at least 2007, when the first offering, of a coin, was documented. The first apple at Minerva was observed in 2010. In 2013 some students began writing their wishes on their apples with a Sharpie. Others began sticking coins in the fruit. More and more, students take a big bite or two out their apples before setting them down. How this tradition started is unknown. But UNCG students have made it their own. Each semester at exam-time, students tweet about the apples and coins. It’s quite a sight. At one time during December exams, there were about 130 apples. On October 5, 1892, just under 200 students began classes at the institution then known as the State Normal and Industrial School (now UNCG). As the student body grew, campus traditions and symbols developed. Convocation in some form has been a part of UNCG tradition for decades. Early versions of Convocation included campus-wide picnics, movies, and skits led by upperclass students. Our Convocation activities today draw on many of the traditions associated with the earlier Convocations, while also adapting to changes in culture and our University. 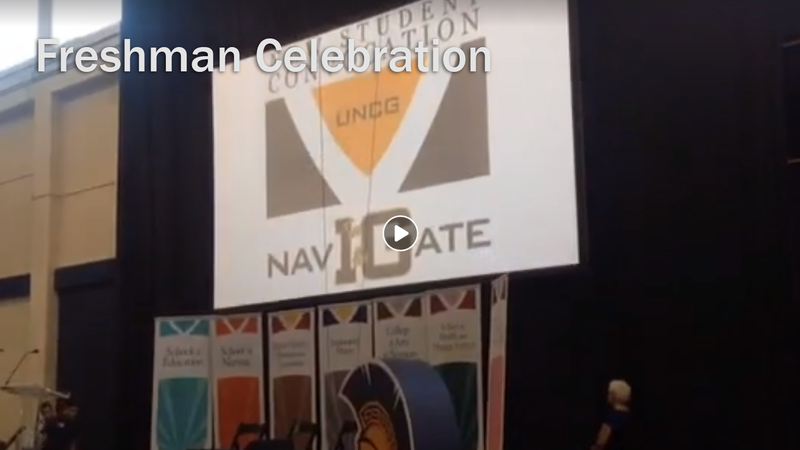 Beginning in the fall of 2017 and coinciding with UNCG’s 125th Anniversary, New Student Convocation once again changed to meet the needs of our students; NAV1GATE New Student Convocation was launched. NAV1GATE is a day-long event for all new students, offering a celebratory welcome and a day rich in the history and traditions of UNCG. This day, the first day of the fall semester, is designed to help new students get to know the people, ideas, and opportunities that await during their time here at UNCG. It is a day set aside entirely for new Spartans to be inspired while also getting serious about the path ahead. NAV1GATE helps new students connect with faculty, staff, and student leaders who will show them the resources and support systems available to help them excel in their first year. While the day is designed to get Spartans ready for the academic experience ahead, it is a time to have fun and meet new friends, faculty, and staff. West Drive from Gray Drive to Walker Avenue will be permanently closed from 7:30 a.m. to approximately 1:30 p.m.
Walker Avenue Eastbound will be closed at Kenilworth Street from 7:30 a.m. to approximately 1:30 p.m. Traffic will be allowed to turn right onto Kenilworth Street to access the Walker Parking Deck from Theta Street. Stirling Street Northbound will be closed at Theta Street from 7:30 a.m. to approximately 1:30 p.m Traffic will be allowed to turn left onto Theta Street to access the Walker Parking Deck from Theta Street. Spring Garden Street Westbound at Tate Street will be closed from 1:30 p.m. to approximately 3:00 p.m. while students transition from lunch on College Avenue to the Gate City Plaza. Spring Garden Street Eastbound at Kenilworth Street will be closed from 1:30 p.m. to approximately 3:00 p.m. while students transition from lunch on College Avenue to the Gate City Plaza. Forest Street between Oakland Avenue and Spring Garden Street will be closed from 1:30 p.m. to approximately 3:00 p.m. while students transition from lunch on College Avenue to the Gate City Plaza. Glenwood Street between Haywood Street and West Gate City Boulevard will be closed from 1:30 p.m. to approximately 3:00 p.m. while students cross over Gate City Boulevard and proceed to the Kaplan Wellness Center for Convocation Craze. College Avenue will be closed to vehicular traffic (with the exception of emergency vehicles) for the day to allow Dining Services to set up for lunch as well as clean up afterward. In front of the Foust Building on Administrative Drive will be closed from 7:30 a.m. to approximately 3:00 p.m. to allow Dining Services to set up for lunch. NAV1GATE is for all incoming freshmen and transfer students. It is a full day set aside for you to begin to understand the people, ideas and academic opportunities that await you during your time here at UNCG. NAV1GATE is the first official day of the semester. This is the day before the first day of classes. NAV1GATE is required for all new freshman and highly recommended for transfer students. Attendance will be captured at various events throughout the day. Please wear your NAV1GATE t-shirt so that you are placed in the correct academic group. Dress casually and for the weather (e.g. shorts or pants since you may be sitting on the floor or grass at certain points throughout the day). Wear comfortable shoes as you will be walking campus. Where do I get my free shirt and swag bag? Pick up your free NAV1GATE t-shirt and swag bag after the class photo on Sunday, August 12. Be sure to bring your student ID to confirm your attendance. What time do I need to be at the convocation celebration? Students can enjoy breakfast in Fountain View beginning at 7 am, then proceed to the Fleming Gym by 8:15 am. Commuter students should arrive at campus by 7:30 AM for parking in the Walker Ave. Parking Deck, then proceed to Fountain View Dining Hall for breakfast. The Fleming Gym is in the Coleman Building; enter on the West Drive side, near the tennis courts. The address for Fleming Gym is 1408 Walker Ave.
NAV1GATE is an all day event. Breakfast begins at 7:00 am in the Fountain View Dining Hall. All new freshman students will be brought to the Fleming Gym between 8:00-8:15am. If you are commuting to campus, arrive by 7:30 AM to Fountain View dining hall. When does this event end? The Convocation Craze @ Kaplan marks the end of your NAV1GATE journey. This event is scheduled from 2:00 pm until 4:00 pm at the Leonard J. Kaplan Center for Wellness at 301 W Gate City Blvd, Greensboro, NC 27403. Bring your student ID and your NAV1GATE schedule (in your swag bag). The bottled water and snack are optional to bring. Of course, you’ll wear your NAV1GATE t-shirt!. Also, be sure to bring any items you might need throughout the day, such as a cellphone, medications, etc. You will not have a chance to return home or to your residence hall throughout the day. I’m a commuter. Where do I park? All commuter students attending NAV1GATE can park in the walker avenue parking deck free of charge by showing your NAV1GATE t-shirt as you exit on level 3. Once you park, proceed to Fountain View dinning hall for breakfast between 7 and 8 AM. If you arrive to campus after 8 AM, please head directly to the Fleming gym. Hear from our Chancellor, Franklin D. Gilliam, Jr. Learn about campus resources you need to succeed in classes starting tomorrow! Have tons of fun with your new friends. A full schedule is in your swag bag that you will pick up Sunday, August 12, after the class photo. There is also a copy on this website. Let us know you’re having fun! Follow @uncgyfy and like UNCG Your First Year on social media, and don’t forget to include #NAV1GATEUNCG and #UNCG22 in your posts! Be sure to find the NAV1GATE Snapchat filters! Will I need a campus map? Don’t worry if you are still unfamiliar with campus! We will have upperclass students at designated locations to guide you throughout the day. Just look for our NAV1GATORS in LIME t-shirts! NAV1GATE is a rain or shine event. In the case of rain, some events will be moved indoors. If necessary, you will be notified of the adjusted rain schedule during the convocation celebration. Remember, you can find the full schedule of events and schedule changes on this website. I need accommodations to get around campus. Who should I contact? If you are an individual with a disability and will have access or accommodation concerns related to attending and participating in NAV1GATE, please contact the office of New Student Transitions and First Year Experience at 336-334-5231 or yfy@uncg.edu by August 6. The day Following NAV1GATE, Tuesday, August 14. Are there activities for returning students? Returning students do not attend this event. If you are a returning student with a meal plan, join other returners for lunch at the Fountain on Moran Commons. If it rains, lunch will be inside of Fountain View Dining Hall. NAV1GATE is for incoming freshmen and transfer students. It is a full day set aside for you to begin to understand the people, ideas and academic opportunities that await you during your time here at UNCG. Pick up your free NAV1GATE t-shirt and swag bag after the new class photo on Sunday, August 12. Be sure to bring your student ID to confirm your attendance. Students can enjoy breakfast in Fountain View beginning at 7 am, then proceed to the Coleman Auxilary Gym by 8:15 am. NAV1GATE is an all day event. Breakfast begins at 7:00 am in the Fountain View Dining Hall. All new students will be brought to the Coleman auxiliary gym between 8:00-8:20am. If you are commuting to campus, please be at the Coleman auxiliary gym by 8:30 am. The Convocation Craze @ Kaplan marks the end of our NAV1GATE journey. This event is scheduled from 2:00 pm until 4:00 pm at the Leonard J. Kaplan Center for Wellness at 301 W Gate City Blvd, Greensboro, NC 27403. Bring your student ID and your drawstring bag with NAV1GATE materials, and the bottled water, and snack we provided. Of course, you’ll wear your NAV1GATE t-shirt!. Also, be sure to bring any items you might need throughout the day, such as a cellphone, medications, etc. You will not have a chance to return home or to your residence hall throughout the day. All commuter students attending NAV1GATE can park in the walker avenue parking deck free of charge by showing your NAV1GATE t-shrit as you exit on level 3. If you arrive to campus after 8 AM, please head directly to the Coleman auxiliary gym. Let us know you’re having fun! Follow and like UNCG Your First Year on social media, and don’t forget to include #NAV1GATEUNCG in your posts! Be sure to find the NAV1GATE Snapchat filters! NAV1GATE is a rain or shine event. In the case of rain, some events will be moved indoors. If necessary, you will be notified of the adjusted rain schedule during the first event of the day. Plan accordingly and bring an umbrella if the forecast calls for rain. If you are an individual with a disability and will have access or accommodation concerns related to attending and participating in NAV1GATE, please contact the office of New Student Transitions and First Year Experience at 336-334-5231 or yfy@uncg.edu by August 6th. The day after NAV1GATE. Tuesday, August 14. All faculty and first-year course instructors are encouraged to participate in NAV1GATE to positively impact the successful transition to college for our new undergraduate students. The Dean of each academic unit will be communicating further with faculty members about the details of this event. SOS and Spartan Guides need to check in at 6:30 a.m. in Moran Commons / Fountain View, Moran 109. PALs need to check in at 12:00 p.m. Moran Commons/Fountain View, Moran 109. You will be given a volunteer t-shirt to wear. Where do I pick-up my volunteer t-shirt? You may pick up your volunteer t-shirt at Volunteer Training. More information about Volunteer Training will be emailed to all student volunteers/SPEARS over the summer. What if I need to change my volunteer shift? Changes to shifts cannot be made except in the case of an extreme emergency. If you’ve had an extreme emergency, please contact the supervisor/advisor of the group that you represent. Who do I call the day of if I have questions? Text questions to YFY at 1-336-663-1719. Are any meals being served? If you are volunteering during the morning/first shirt, breakfast will be available in Moran 109 between 6am-7:30am. If you are volunteering during the second shift, you may join freshmen at lunch on College Avenue. You will need your SpartanCard to swipe for your boxed lunch; you will not be charged a meal from your meal plan….that’s on us!